2019 marks a special time in the history of our church as we celebrate the 75th anniversary of Our Lady of the Rosary. We would like to make this year, a year of spiritual growth and renewal. Fr. Ambrose, along with the evangelization committee, is appealing to all parishioners to participate in the 75 day Rosary Challenge, from January 1, 2019 to March 16, 2019. This can be said with family, friends or oneself. 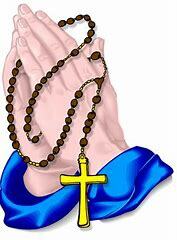 Rosary beads and cards are available in Rosary Hall for your use. Always remember that Our Lady of the Rosary is our Mother and our friend. She mediates for us between God and the World, between Christ and the Church and the world of saints and this veil of tears. May she stand with you at all crossroads of your life and point the way to her Son, our Lord Jesus Christ. Amen.